For several years, my grandmother has been trying to send me home with items from her china cabinet. I think she’s always a little surprised when I pick out things like the tiny collapsible tin cup that belonged to my grandfather or a weathered aluminum cake carrier instead of fine crystal platters and silver pitchers. 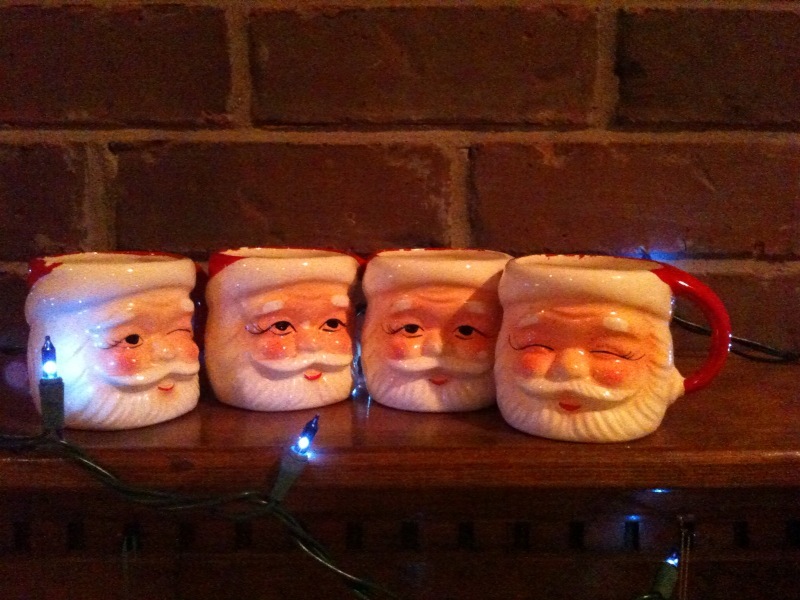 For me, memorable beats fancy every time, which is how I ended up with these four Santa mugs. My grandmother would break them out once a year for eggnog, though I’m not sure how many family members actually drank from them, given their paltry size (they may hold 4 ounces). They’re the coolest retro Christmas accessories I have, but most importantly, they store memories that the fanciest crystal glasses could never evoke. Best of all: no polishing required. What a cool story! I have tons of memories around Thanksgiving and Christmas. When I was small my great-grandmother was still alive and we had a VERY large extended family visit our house each year. After she passed away and over the years the size of the gathering has continued to get smaller, but we still get to use some of the Christmas dishes, trinkets, and decorations we’ve had all along. I agree, the memories are way more valuable that the fancy stuff! My parents have the same mugs! I love those.